The month of January started out with the troublesome news that five activists had gone missing from Pakistan. Salman Haider (Islamabad), Ahmed Raza Naseer (Nankana), Ahmed Waqas Goraya (Lahore), Aasim Saeed (Lahore) and Samar Abbas (Karachi) all disappeared in the first month of the new year. The reason for their disappearance is still unclear but it is likely that they were targeted on the basis of their online speech. Civil society activists conducted protests all across Pakistan in the wake of these disappearances, and international pressure was also mounted on the government. Digital Rights Foundation also took part in the protest in Lahore. By the end of January, reports surfaced that the missing activists had made contact with their families. There are several unanswered questions regarding the disappearances and many of the returned are reluctant to speak out about their ordeal. One of the activists had left the country following his release. Another worrying aspect of these disappearances were the concerted social media campaigns to malign these missing activists, one that was backed up by the mainstream media and presenters, such as Amir Liaquat. Amir Liaquat is the host of the program “Aisa Nahi Chalay Ga” on Bol TV. 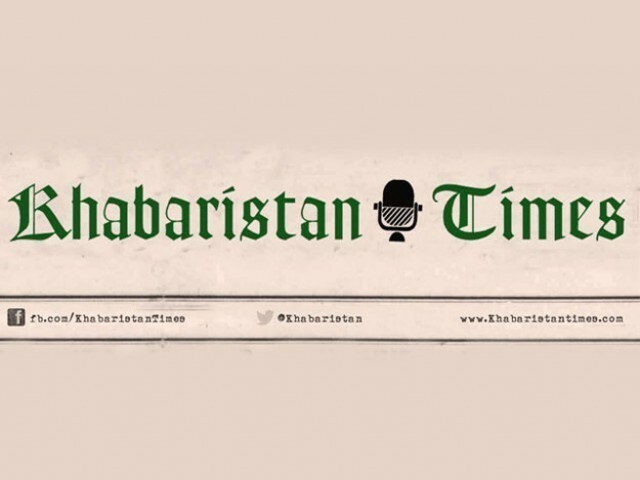 In the month of January, has been accusing several activists and journalists of anti-Pakistani activities as well as levelling blasphemy charges against progressive voices. 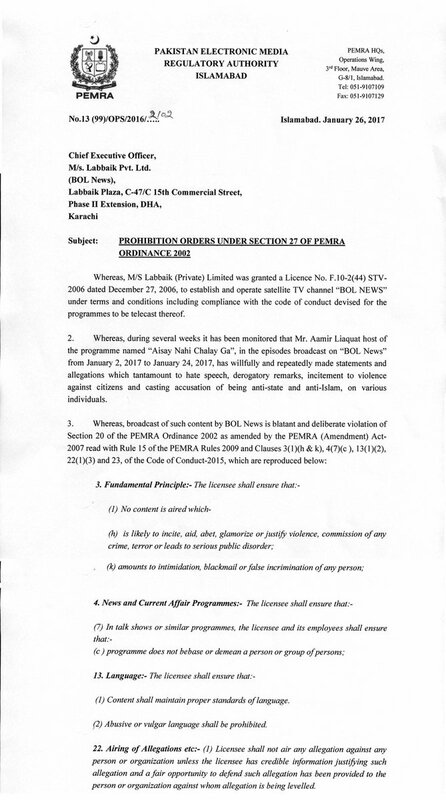 Bol TV however did not immediately comply with PEMRA’s order and continued to air Amir Liaquat’s show despite the hate speech and incendiary content of his speeches. The Supreme Court of Pakistan has come down hard on Bol and the channel signed an undertaking pledging not to air Amir Liaquat’s show until further notice by the court. 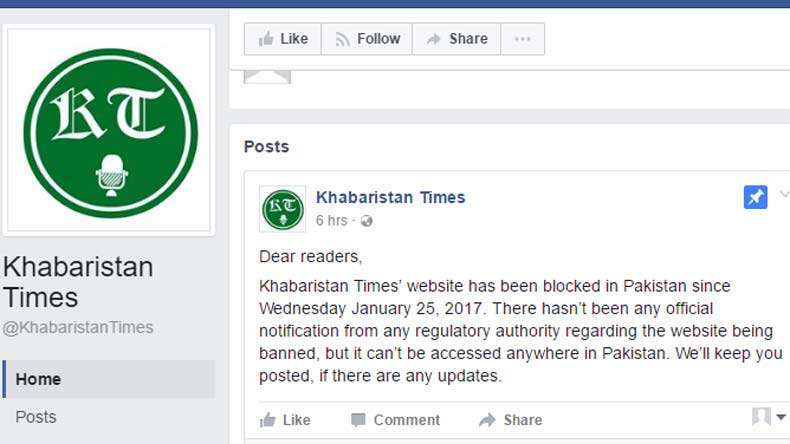 Pakistan’s satire publication, Khabaristan Times (KT) has been blocked in Pakistan since January 25. Digital Rights Foundation strongly condemned the ban in its official statement and stands in solidarity with the publication. 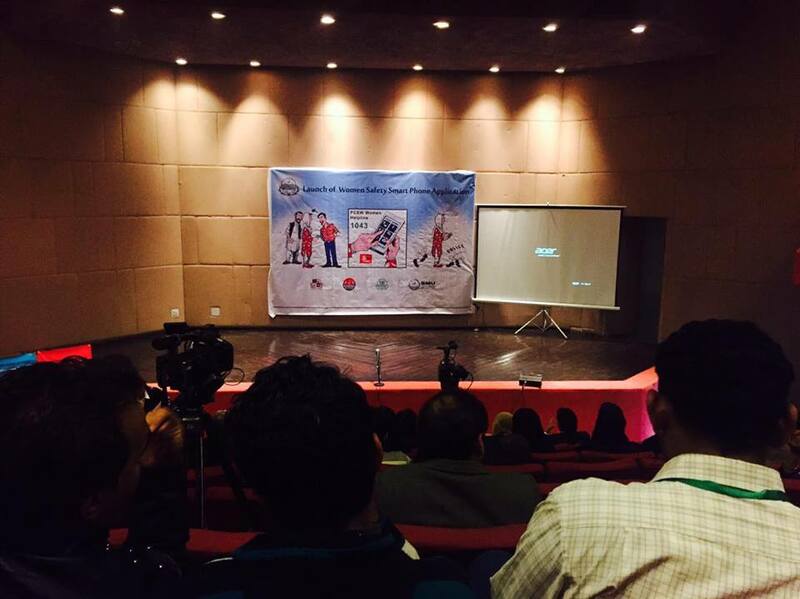 The Punjab government launched its Women Safety Smart Phone Application. The app was launched on January 4, 2017 by the Punjab Safe Cities Authority (PSCA) in collaboration with the Punjab Commission on Status of Women. This application allows allows users to send notifications to the Police Integrated Command, Control and Communication (PPIC3) if there is an incident of harassment and security forces will be dispatched to the location immediately. 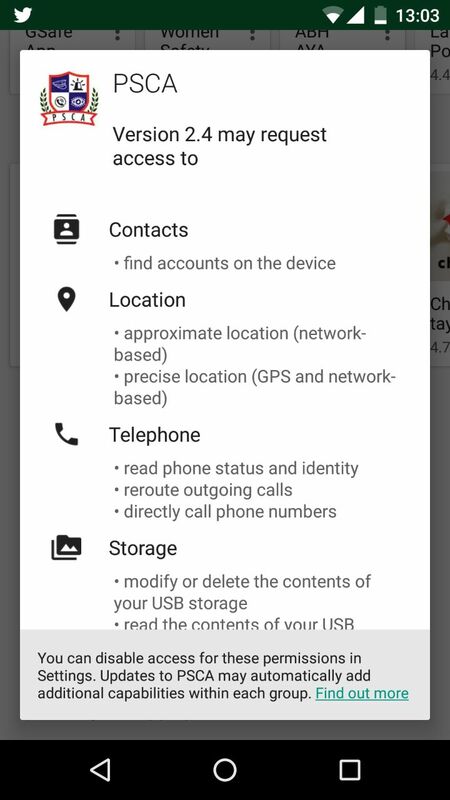 The application also allows users to mark places and locations as “unsafe”, which will help authorities in planning activities and other users as well. 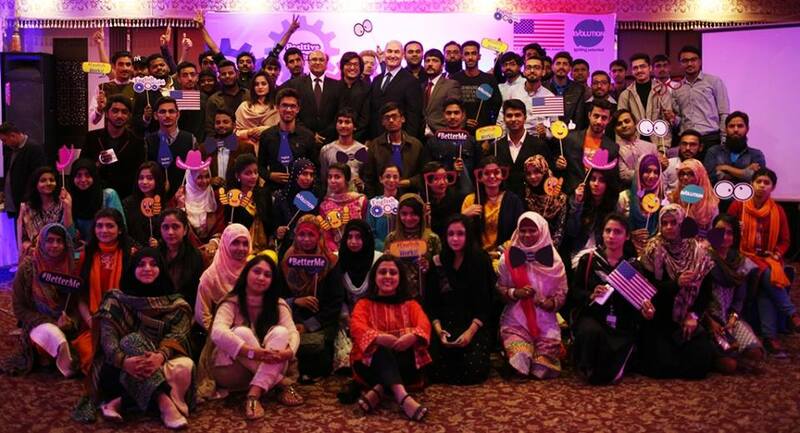 Digital Rights Foundation attended the launch event for the application. We shall follow up with the developers and the authorities regarding our problems with permissions and privacy policies of the application. 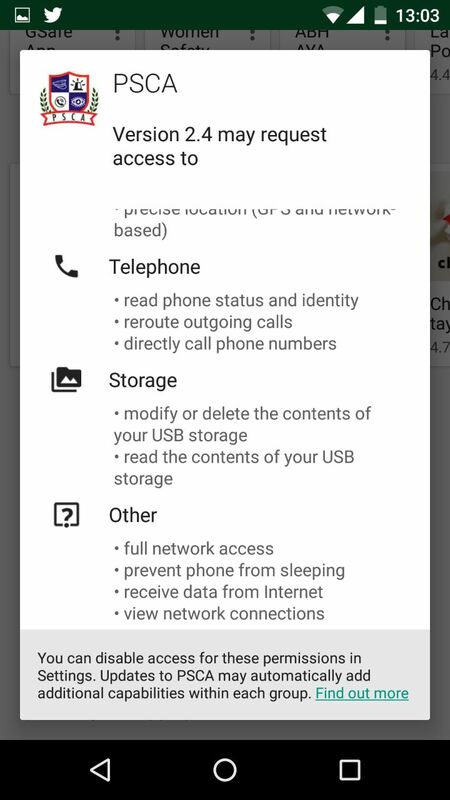 The fact that the application gains access to a lot of personal data as displayed in the permissions section, the onus is on the authorities to assure citizens about why the data is collected and how it is securely stored. The Punjab government also launched around 192 hotspots in three big cities of the province, including Lahore, Rawalpindi and Multan. According to reports, in order to log in citizens will be required to given their name, date of birth, profession and mobile number. Digital Rights Foundation is also concerned about the information that this required for this service and the monitoring of online activity with users are logged into the service. Digital Rights Foundation was recently alerted to the fact that internet services in Federally Administered Tribal Areas (FATA) have been suspended since June 12, 2016. This denial of internet access to a large segment of Pakistan’s population has gone unexplained by the authorities, and DRF will continue to highlight the issue until services are adequately restored. You can read our blog post on the issue here. DRF organized a workshop on account of international Safer Internet Day on the 7th of February in Beaconhouse School System Boys Branch. 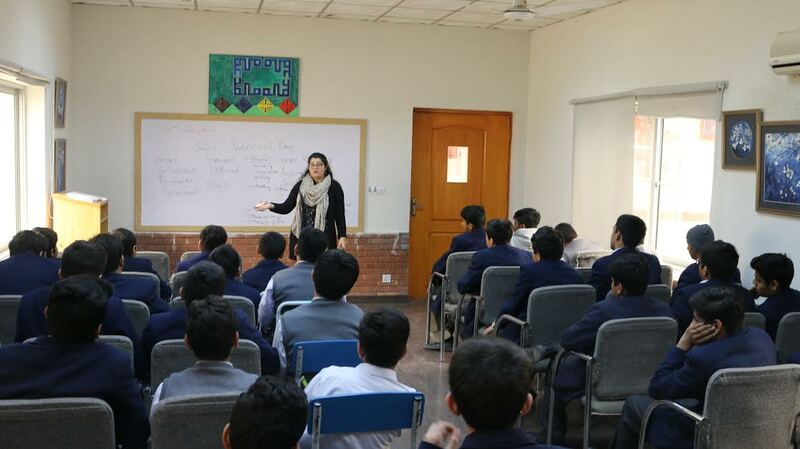 Seerat Khan, Jannat Fazal and Huda Jilani conducted the workshop with the enthusiastic secondary school students, which was based on cyberbullying and the safety measures children should adopt while using the internet. 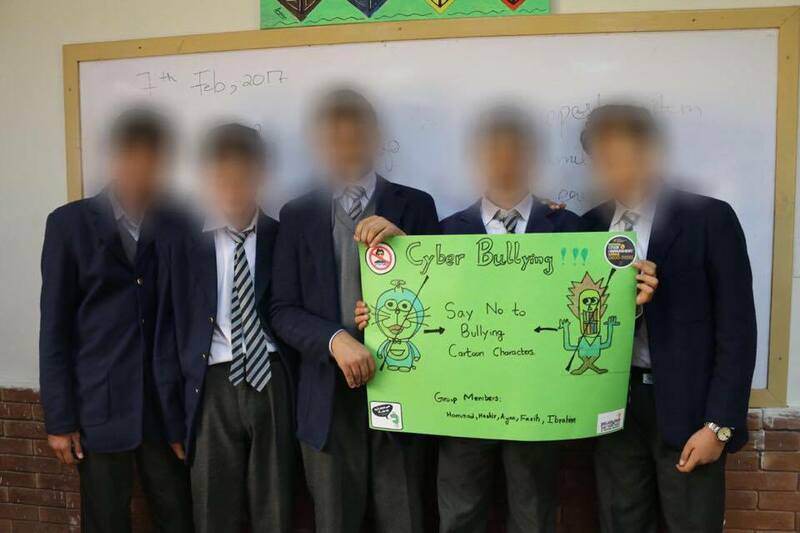 During the workshop, children also designed posters and wrote about how they felt about cyberbullying. The need of these workshops in schools was recognized and a survey was also conducted to understand the nature of cyberbullying in schools. DRF hopes to expand the project to more schools in the near future. 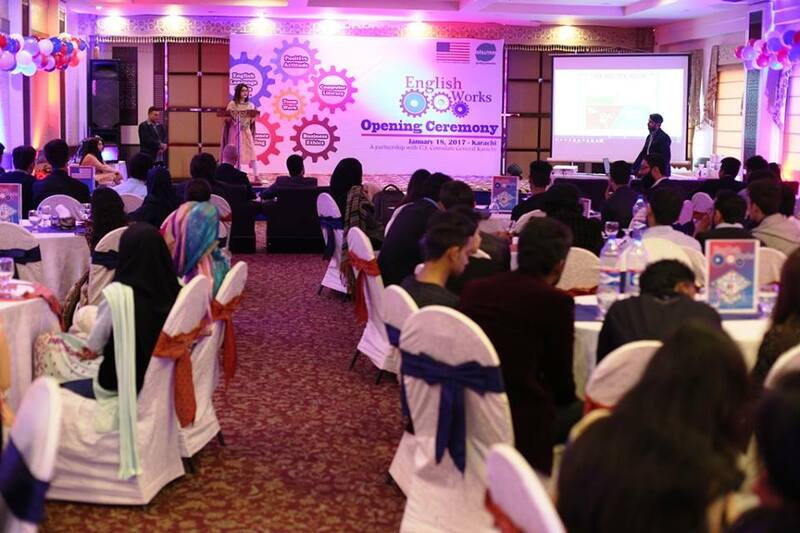 On January 18, 2017, Hija Kamran - Communications Manager at Digital Rights Foundation, spoke to the students at English Works opening ceremony - a six month English learning course - organised by Evolution in partnership with the U.S. Consulate General Karachi. During her talk, Hija emphasized on the importance and need of Women Rights in Digital Spaces, Cyber Harassment, and how to counter the said harassment. Along with this, Hija also discussed the harassment that Qandeel Baloch faced, and the harassment that 22 year old Naila Rind faces for three months which ultimately led her to commit suicide in her hostel room. 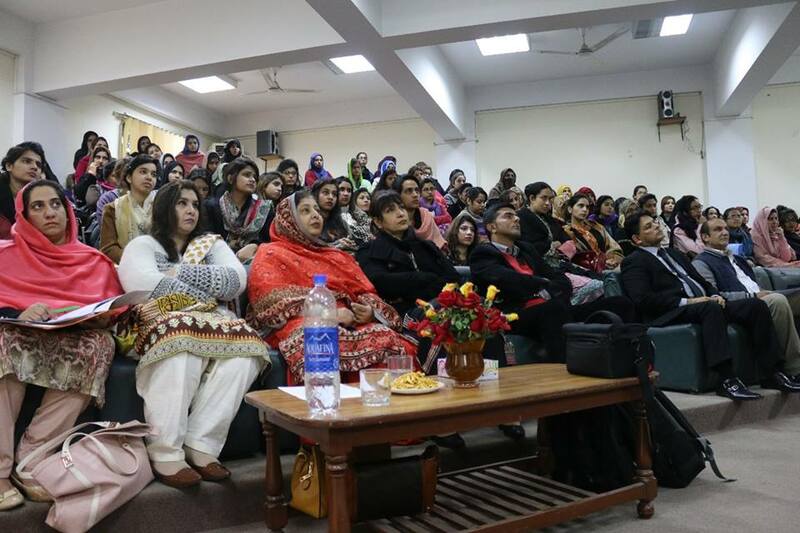 Huda Jilani, Program Assistant at Digital Rights Foundation, was a speaker and panelist at a seminar conducted by Search for Justice (an initiative by CAN Pakistan) and the Social Work Department at Lahore College University for Women on January 18, 2017. 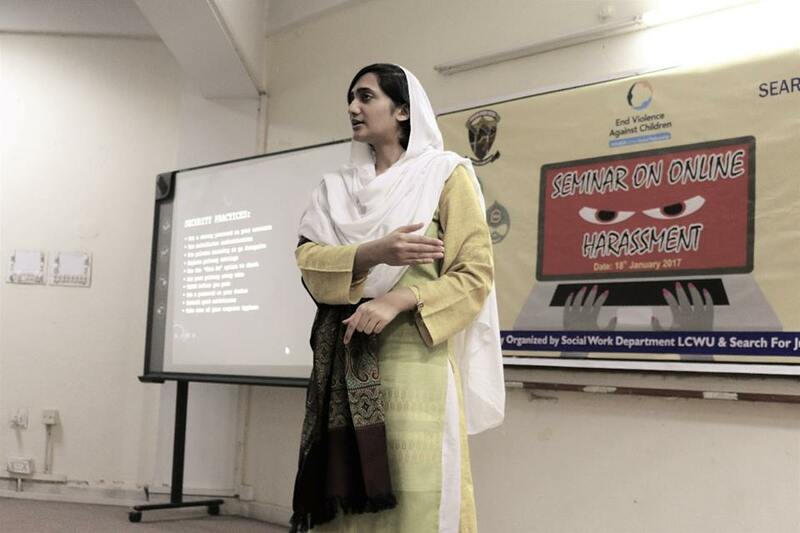 The seminar focused on Online Harassment specifically in context of social media and ways and strategies to avoid it. Mr. Shahid Hassan, a representative of the FIA, was also a speaker at the event. "Harassment, unfortunately, is a fact of life for many women in spaces other than the place of work. Most public spaces are hostile environments for women. It is for this reason that street harassment is also criminalised under section 509 the PPC in Pakistan. It comes as no surprise that cyber spaces are no different when it comes to the experience of women and minorities. Out of the 3027 cybercrime cases reported to the FIA during August 2014- August 2015, 45% involved electronic violence against women (e-VAW)." Read the full article "Harassment as a Legal Concept in Cyber Law" here.